Many teeth have crack lines that you can see on the enamel surfaces. Some of these cracked teeth are stained and painful when chewing, while others are not. In our dental practice, we see the cracks occur more often in the adults’ teeth than in the youngsters’. Many teeth with cracks do not have any symptom because the cracks are running superficially (running on the outer layer of the tooth). Occasionally, when the crack runs deeper into the pulpal area, the tooth is sensitive to changes in tempera ture and in chewing. Because dental x-rays cannot reveal about extent of the crack, the diagnosis, management, and prognosis for tooth in question is mainly based on the clinical observations. Our Houston dentist recommends that if the crack is symptomatic or is located next to an old restoration such as an amalgam filling, the tooth should be restored with either a porcelain onlay or a crown. If the cracks are on the front teeth, porcelain veneers are recommended. The types of restoration can protect the cracked tooth from a sudden breakage. 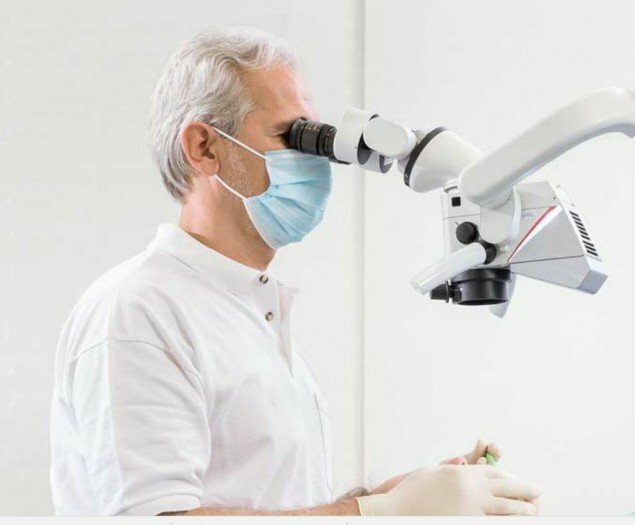 Our Houston dentist recommends “a close watch” for those cracks under the surgical microscope for asymptomatic or are located on a never-been-restored teeth. The location and the extent of the cracks should be recorded and checked every 6 months. If any of these cracks becomes longer, darker, and deeper or if the tooth begins to feel sensitive, it should be immediately restored with CAD/CAM onlay, crown, or veneer.